If you are like most people and love the look of wood flooring you have two main options – hardwood or laminate. The following looks at how these two popular types of flooring compare when it comes to the most important factors. If price is a key concern for you then laminate is a great choice. 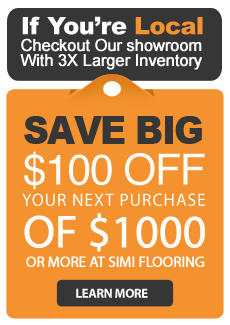 On average you will pay roughly half the price for a laminate floor than you will for hardwood flooring and exotic types of hardwood are even more expensive. However, keep in mind that even though hardwood can be rather pricey it will add a considerable amount to the value of your home. While laminate is designed to mimic hardwood, a well maintained hardwood floor has a depth, texture and beauty that is far superior to laminate flooring. Hardwood also looks better for longer, with damage to hardwood usually far less noticeable than damage to laminate flooring. The outer layer of laminate flooring is made using high heat and pressure, creating a surface far harder than hardwood and therefore more resistant to damage. Being a natural material, hardwood is a lot softer than laminate and therefore more vulnerable to scratching, gouging and general wear. Laminate floors are notoriously difficult to repair, because even if you can remove and replace individual sections of the laminate (which isn’t always possible) these areas will usually stand out like a sore thumb. Hardwood flooring, on the other hand, is much easier to repair, as often you can sand and stain a damaged area or replace individual boards and it will blend in beautifully. Laminate floors are extremely easy to clean, with a regular sweep and mop often enough to keep them looking good. Hardwood is a little fussier. Any liquid spills need to be wiped up from hardwood quickly to prevent damage to the floor and special hardwood cleaners are also required for regular maintenance. Few flooring types will last anywhere near as long as hardwood flooring. While you can expect to get 20 years out of a laminate floor at most, a hardwood floor can last between 40 and 80 years or even longer if you take care of it. Laminate flooring is designed to be moisture resistant, making it suitable for almost any room in the house – hardwood is far less flexible. Being a natural material, hardwood is vulnerable to the effects of moisture, so it is unsuitable for areas such as the bathroom, laundry room or anywhere it may get wet. Hardwood is made from solid pieces of wood, making it 100% organic and an eco‐friendly option.Laminate is made using energy intensive processes that involve high heat and pressure to bond resin and composite materials, making it far from environmentally friendly. Choosing the right flooring for your home is a major decision that should not be taken lightly. For best results, do plenty of research and seek professional advice.